The Cycling Dude: Acura Bike Tour: Bicyclist's, Start Your Pedaling! 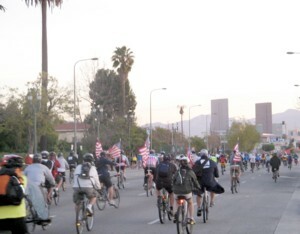 Acura Bike Tour: Bicyclist's, Start Your Pedaling! 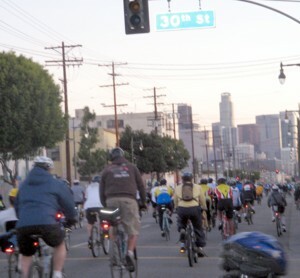 NOTE 2: For latecomers interested in my coverage of the 2007 Acura L.A. Bike Tour only, begin here. 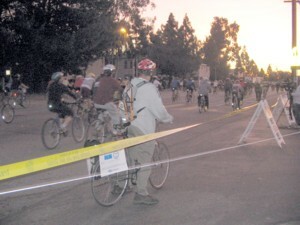 As the sun began to rise we all headed out on Menlo. Even this early there were many people on the sidewalk, just to watch the spectacle, or setting up water tables, and other booths. A nice, young, Hispanic lady was kind enough to take this shot for me. At the Expo they were giving out these placards with happy faces, and the word RUN, with a line to write the name of the person you were cheering on. Genius that I am I saw an opportunity, for promotion staring me in the face, and grabbed 2 of the signs. Heading out Martin Luther King Blvd. we travel on Jefferson, as well as Adams Blvds. Funny hats, and funny t-shirts, joined the flag wavers, and me with my signs, to add and amusing mix of Color, silliness, and seriousness, to the proceedings. Heading onto 11th street, up San Pedro St., to Olympic Blvd., we get a close look at portions of the famous Fashion District ( AKA: Garment District ). 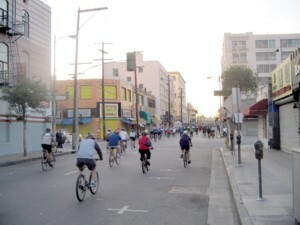 As the website brags: "The LA Fashion District spans 90 blocks and is the hub of the apparel industry on the West Coast. Retailers, wholesale buyers, designers, stylists, students, shoppers and residents all converge here. Whether you're a wholesale buyer reviewing the latest collections in the District's designer showrooms, or a shopper on the prowl for a bargain - it's all here." The 1st hill, and 1st bridge, confront us as we head east on Olympic. The Olympic Blvd. 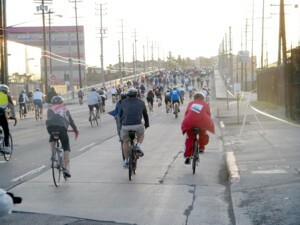 Bridge takes us out of Downtown and into the western edge of East Los Angeles, in the area along Boyle St. The 6th Street Bridge is justly famous as the longest bridge over the Los Angeles River, and for the spectacular view, from east to west, as THIS VERY RECENT PHOTO, does such a gorgeous job of showing. 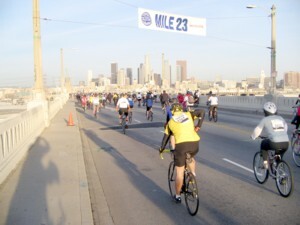 That mile banner is for the Marathon, not the cyclists! Next up: We head into a seedier side of Downtown that, in recent years is showing signs of revival, and check out the center of Downtown, before heading westward.